The intention of this chapter is to contribute to the scholarship of diversity, equity, and inclusivity in contemporary higher education. Its purpose is to develop an understanding of pedagogical issues concerning the inclusion and support of students with disabilities in the South African higher education system through literature review. 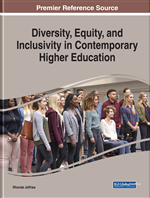 The chapter will contribute to debate on policy imperatives and how these have informed practice, the social model of disability and its role in shaping educational provision, access and support constraints as products of intersectionality of disability and disablement, and possible ways to re-culture higher education for support. In this chapter, the following concepts; Inclusion, Support, and transformation will mean the following: Inclusion means that everyone belongs, is accepted and supported (Swartz, Sandall, Odom, Horn, & Beckman, 2002). Support means creating an environment where everyone is cared for and loved, esteemed, and a member of a network of mutual obligations (Cobb, 1976). Transformation means the radical shift from one state of being to another, and includes a shift of culture, behaviour, mind-set, and the way the university and its people regard disabled students (Poutiatine, 2009).